The Strange Case of Homo naledi: In September 2015 newspapers throughout the world heralded an amazing new human fossil discovered by spelunkers who were spelunking around inside the Rising Star Cave in South Africa. 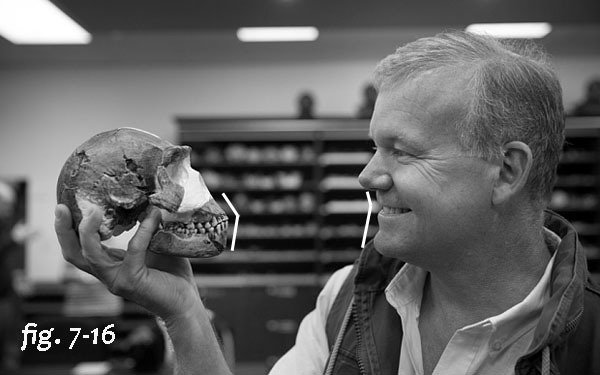 Lee R. Berger, a paleoanthropologist Witwatersrand University, along with National Geographic, announced the discovery. The new hominid was named Homo naledi. I got the news from the Associated Press in my Orange County Register newspaper. Of course, I had to check out what was really behind the story to keep my book as updated as I possibly can. So wrapping up the book was put off for a few more weeks… I got the news from the Associated Press in my Orange County Register newspaper. Of course, I had to check out what was really behind the story to keep my book as updated as I possibly can. So wrapping up the book was put off for a few more weeks. The story of the find began in August 2013 in South Africa. It’s recounted in the NOVA/PBS/National Geographic documentary titled The Dawn of Humanity. A great deal of the information in the following pages comes from this documentary, which you can easily access online. An ex-soldier, prospector, and adventurer, Pedro Boshoff, asked his friend Lee Berger for a job, as he was unemployed. Berger had known Boshoff for over twenty years. Berger really didn’t have anything in the way of a job for Boshoff, but he told him to go out in the wild and look for hominid remains. Was Berger sending Boshoff out on a wild goose chase? In the documentary, Berger says that most paleontologists that dig for fossils will never even find a single hominid tooth; and that 80 to 90 percent of the hominid fossil record is composed of just bits of isolated teeth. Hominid fossils are incredibly rare. Berger knows the chance of Boshoff finding even a tooth is infinitesimal. But Berger was so confident that Boshoff could find hominid fossils that he bought him a motorcycle so he could “move around out there”. What a nice guy Berger is for buying the motorcycle. And what a strange gift! Interestingly he bought Boshoff a street bike (fig. 7-9) that can be used only for street riding. Street bikes like Boshoff’s are extremely heavy. They usually weigh over 700 pounds. They would be way too awkward to ride on dirt. If one tipped over, it would be very difficult to lift back up. If Berger wanted Boshoff to get out in the dirt and find fossils, why didn’t he get him a dirt bike that could be used both on the street and on dirt? Was it nice for an employed dude like Berger to send an unemployed dude like Boshoff, who needs work and money, out on a search for fossils that Berger knows has a microscopic chance of being successful? Does Berger have a 6th sense? Does he know something no other paleontologist knows? It sure seems like he does. Berger told Boshoff to “go out and enlist your caving buddies, go underground, and see if you can find something… go to the most well-known places”. A very odd suggestion, since the “most well-known places” would have the least chance of coughing up fossils. If fossils were present “in well-known places” they would have been discovered by now. 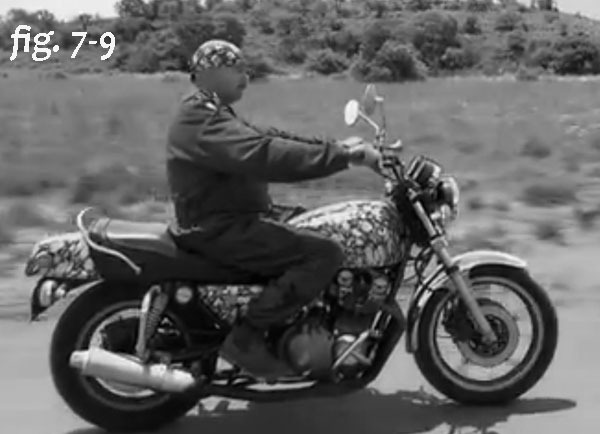 But off Boshoff went, on his beautiful new motorcycle, straight to a “well-known” cave as Berger directed. There he ran into two spelunkers, Rick Hunter and Steve Tucker. He apparently didn’t know either of them. Even so, he asked if they would search the caves for hominid fossils. Boshoff would cover the west area of “the Cradle of Humanity”, an area that was thought to be where man first appeared, whilst Steve and Rick searched the east. Steve and Rick ostensibly agreed to do the search. On September 13, 2013, Steve and Rick made their way into the Rising Star Cave, one they knew well. They went through a series of claustrophobic, dangerous, dark, and daunting openings, all because a complete stranger asked them to. I certainly wish I had Boshoff’s power of persuasion. At what seemed like the very end of the cave was a tiny tubular opening called Superman’s Crawl (see the diagram above), which was less than ten inches high. They had to squeeze through, pushing with their toes; it was too narrow to pull themselves with their hands, or to crawl. Superman’s Crawl was very claustrophobic; kind of like crawling through an underground drainpipe. Superman’s Crawl leads into a second large chamber with a 75-foot rising cliff at the end called Dragon’s Back. Of course, they climbed up the cliff. At the top was another minuscule opening. Steve crawled into the opening first. It went forward horizontally for about twenty feet. Then it made an almost 800 downward drop into another crevasse which was about 7-½ inches wide, and as high as a four-story building. I’m getting acrophobic and claustrophobic just writing this. Of course, Steve had no idea what was at the end of the downward 7-½ inch wide opening. Except for his headlamp, it was pitch dark. As he descended, his feet were “dangling into empty space”. He had no idea how far the bottom was. Picture yourself standing over a four-story building with another building 7-½ inches away; in pitch dark. Would you squeeze yourself down in between the buildings to see what was on the ground? 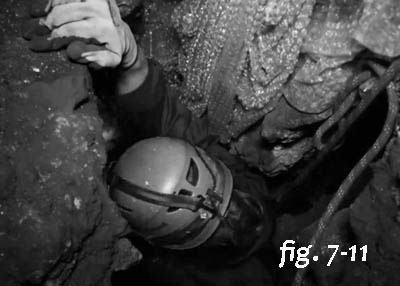 For all Steve knew, it could have been a 100-foot drop, and this could have been a fatal bit of spelunking, and his last. What would be the odds of finding hominid fossils at the end of this crevasse anyway? But Steve courageously kept moving. He squeezed down and finally found a landing for his feet. What if the crevasse narrowed and he became stuck? Or opened and he fell? Scary thought. Luckily it didn’t narrow. It opened into another cavernous chamber! He told Rick to join him, which he did. This is one of the biggest mistakes a spelunker can make. Both cavers were inside of a chamber that allegedly had never been entered by any man. No person knew it existed. The entry was very minuscule, and difficult to navigate. Steve and Rick’s cell phones wouldn’t have worked inside that chamber. What if they couldn’t climb back up the 40-foot crevasse to get themselves out? What if rocks came loose and trapped them? No person outside had any idea where they were. They could have died in that chamber, added their bones to the bone collection they were about to discover, and never been found. They did this amazing bit of caving simply because Boshoff, a complete stranger, asked them to. This is a real WOW moment. Did they know what they were doing more than NOVA intimated? At any rate, entering a hidden chamber inside of a cave that has a minuscule entry, without any person outside knowing where they were, was very dangerous. It completely goes against the Safety Rules for Spelunkers. Steve and Rick were shocked to find this last chamber was full of bones! In fact, there were many long bones, and a broken piece of jaw with four teeth, just sitting there in the dirt. (fig. 7-10) Well, what would any normal spelunkers do? Of course pick up the bones and inspect them in hand. Then put as many as they could in their packs or pockets and hightail it out of there. But they didn’t. Instead, they took photographs. For some reason, Steve and Rick didn’t collect any of the loose bones. After they took the pictures, they squirmed their way back out of the cave. They excitedly showed the pictures to Boshoff, who immediately declared them to be hominid! How did he know? There is absolutely no way of telling what the source of these bones was, but Boshoff knew they were hominid; for certain. Well, off the trio went to Lee Berger’s house. They showed the pictures to Berger, who also quickly declared them not only to be hominid but “clearly hominid!” I am always amazed at how smart these paleoanthropologists are. I’m a dentist, and I couldn’t tell what the source of the jaw fragment (fig. 7-10) was just from the photo. But both Boshoff and Berger knew it was hominid, without a doubt! In fact Boshoff isn’t a paleoanthropologist at all, which makes it even more amazing that he could tell. Did he have a preconceived notion, a 6th sense like Berger? In saying it was hominid, Berger was also aging the jaw fragment. By declaring it’s hominid simply from looking at the photo, he’s also saying it’s millions of years old. Now if I were Berger, the next thing I would have done is get right to that cave. I would give Steve and Rick some big bucks for their efforts. I would give them a bit of training so they could map and mark the locations of the bones. I would tell them to take good pictures, and then carefully pick them up and package them; and above all bring them out to me! After all, Berger didn’t know Steve and Rick at all. Berger and Boshoff were too physically big to enter the fossil chamber. They couldn’t even fit in the 10-inch tubular Superman’s Crawl. Steve and Rick could have surreptitiously gone back, and removed every fossil for their own keeping or controlling. Fossils found in any country belong to that country, in this case, to South Africa. But Steve and Rick should have received the adulation and pats on the back, and been the stars of the NOVA documentary. It was they who risked their lives, and it was they who found the bones. Who knows what Boshoff might have done; he was far more of a finder of those bones than was Berger. In point of fact, Steve and Rick are the true finders of the fossils, not Boshoff or Berger. Even if Steve and Rick didn’t go back and get the bones if I were Berger, I would have been worried sick that word would get out, and an army of spelunkers would squirm their way into the fossil chamber, and remove them all. There were three people that needed to remain silent. Could Berger trust all three not to say anything to anyone? It could have been like the California Gold Rush. How about the South Africa Bone Rush? If I were Steve and Rick, I wouldn’t even have told Boshoff about their find. I would have gone back and dug out every bone I could before Berger could get there and confiscate my discovery; which is exactly what Berger did. Well, Steve and Rick didn’t retrieve the bones on their own for some reason, known only to them. Instead, this fascinating story turned into Showtime, devised and directed by Lee Burger. Berger became world famous in the world of anthropology because of Steve and Rick’s efforts. Steve and Rick will fade off into obscurity. Berger was the star of this historic NOVA documentary. Well, at least Steve and Rick were in it. Berger took full command and control of the discovery, even though he had little to do with it. He contacted National Geographic who funded an expedition that Steve and Rick had already accomplished. Berger spent nearly two months assembling an international team of 60 scientists. I love the term international team of scientists. It sounds so impressive. Who could question an international team of scientists? He also needed some very thin people to fetch the fossils. Why did he need thin fossil fetchers since he already had Steve and Rick? Both were easily able to enter the fossil chamber. Was he worried Steve and Rick would claim the fossils as under their own control, as they could have and should have? Berger took over, and Steve and Rick didn’t seem to mind. “I didn’t know how I was going to find tiny people with extraordinary skills to work in the cave,” Berger said. “So I did what my generation does. I turned to social media.” Berger says he posted an ad on Facebook looking for people who are “skinny and not claustrophobic; they must work well with others. They must be able to drop everything in three weeks and come to South Africa—unpaid. Oh, and have a Ph.D. or masters in paleoanthropology.” Berger had 57 applicants in a very short time. Most were young women. He chose six of the applicants to be cave-o-nauts. When the six thin volunteers got the word that they had been selected, each was excited beyond imagination. Each was certain this would be one of the biggest moments in their lives! Berger, Steve and Rick, the international team of scientists, and the cave-o-nauts gathered at the sight. They set up a control center complete with tents and video hookups. They used two kilometers of wiring so the international team of scientists could see inside the chamber, and observe what the cave-o-nauts were seeing and doing. Berger said the site was reminiscent of the opening of King Tut’s tomb. I say it’s also reminiscent of the control center for the first moon landing. It’s Showtime! The drama began. The petite women with their cameras squeezed through the tubular 10-inch Superman’s Crawl, climbed the 75-foot cliff, and then squeezed into the horizontal fissure, and down the 40-foot deep 7½-inch wide crevasse (fig. 7-11) leading into the chamber where the fossils were. I do have to give these women, and Steve and Rick, lots of credit. The maze they had to go through to get to the fossils was beyond claustrophobic; very scary. I sure wouldn’t have done it, so kudos to them all. The international team of scientists watched on the video monitor with baited breath. The excitement was palpable. And there they were! The images from the cave-o-nauts showed numerous hominid bones spread everywhere on the floor of the chamber. Strangely, Steve and Rick joined the cave-o-nauts in the chamber. Yes, there they were, on the TV monitor shown on NOVA. Which again begs the question, why didn’t Berger simply ask Steve and Rick to be the cave-o-nauts? Why all the drama and the six women? Why did the women have to fly great distances and spend three weeks of their lives, away from their jobs and families? Why didn’t any of them wonder why Steve and Rick didn’t retrieve the bones? They were all so excited and giddy about the whole process; I doubt the thought ever entered their minds. Of course, again, these bones were declared to be those of hominids by Berger. This declaration was made almost immediately because any old ape bones found anywhere on the African continent are immediately declared to be human ancestors. And this set of bones was no exception. They were also declared to be 2.2 million years old. What incredible conclusions! These bones are both from human ancestors, and 2.2 million years old. This is just a given in the venue of evolution’s illusions. Virtually every news organization and every scientific society such as National Geographic and NOVA, and every museum of natural history in the world accepted both conclusions without question. In fact, these astounding conclusions are never questioned; they are promoted. They are part of the illusion. The cave-o-nauts spent three weeks retrieving bones. The skull (fig. 7-12), was buried with its half-round edge perfectly exposed in the surface dirt. How did it get buried in such a perfect yet strange fashion? It looks like someone buried it, then took his finger and wiped the top edge clean. It doesn’t look like some random event happened that caused the burying of the skull. Maybe it was just some sort of crazy luck. Why wasn’t the mandible (lower jaw) buried with the skull? How could one major part of the skull be buried, but not the other? It looks like they got in there because somebody put them there. When you say that, it’s a very controversial thing to say. There are no signs of predation. No predator accumulates only hominids in this way. There isn’t a flow of material into the chamber. And this is where we leave it. Scientifically the best hypothesis we can say is they were put there. If this is true, the implications are far-reaching. The NOVA documentary goes on to try to build the illusion that Homo naledi actually did place the bones in that chamber as some sort of ritual for the dead. No other possibilities are even considered. The international team of scientists, NOVA and National Geographic, are incapable of thinking of any other possibilities except that this ape-like creature with a brain the size of an orange, in complete and utter darkness, carried their dead through that unbelievable maze of crevasses and tunnels and into the fossil chamber. Berger speculates that this would have required light in the form of torches or fires placed at intervals in the cave. So the Homo naledi’s who supposedly did one impossible activity, now, because of that one impossible activity, also have to be credited with another impossible activity. A second illusion must be added to cover for the first, which is that Homo naledis discovered how to use and control fire. Just as one lie leads to another to cover for the first, one illusion leads to another to cover for the first. This ape, with a brain the size of an orange, is now credited with making torches or bonfires to light their way in the cave! And the illusions expand. Apes have an understanding that death is irreversible”, says primatologist Frans de Waal of Emory University. When they see a dead group member, “they’re affected by it and they watch over it and sometimes try to revive it, touch it, and groom it. ”Mourning behaviors are common in chimpanzees. Animals will stop eating, observe a corpse in silence, and even carry dead infants for days or weeks. Moving bodies or burying them is not a typical primate behavior”, de Waal says, “perhaps because most primates don’t stay in one place for long. Now, if you live in a settlement where 50 other people live, you can’t just leave a corpse there,” he notes. Elephants have occasionally been observed covering corpses—both elephant and human—though it’s a less common response than tending to their dying and dead. Indeed, elephants are one of the species that seems most affected by death, and will often stand quietly near carcasses, even from different families. I’m trying to picture if elephants could carry their dead into that fossil chamber. I guess not. 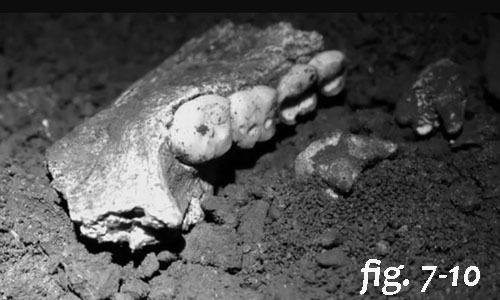 Does this dialogue convince you that Homo naledi dragged their dead into the fossil chamber? Were the bodies placed there by living Homo naledi’s, as a ritual, when they died? Was Homo naledi more sensitive and intelligent than would seem possible? The fact that their brains are about the size of chimp brains should answer that question. If the bodies of dead Homo naledi’s were dragged into the fossil chamber by living Homo naledi’s, the next big question is, who busted up the bones and scattered them all over the chamber? These fossil bones look like someone took a sledgehammer to the entire lot of them. If they were brought into the cave as dead Homo naledi’s, their bones should be intact and positioned together. The skeletons should have remained fully assembled. There was no wind or rain or mud that could break up the skeletons and toss them all around the chamber. They were completely isolated from the outside environment. It looks like whoever placed those bones in the fossil chamber also busted up the bones and tossed them all over. Maybe they buried that skull right up to its edge. And where were the other parts of the mandible? The jaw segment that was present was thick and not worn. The rest of the jaw couldn’t have just dissolved, or disappeared, or eroded away, whilst the part that was found was unaffected. The missing jaw parts couldn’t bury themselves. So where were they? Why weren’t the whole mandible with condyles present in that chamber? Did Homo naledis squeeze through the cave’s maze, in absolute darkness, and become trapped, and die inside the fossil chamber? Apes and monkeys don’t do things like that, so this is completely unlikely. Do modern apes or monkeys place their dead in any cave, even ones that are open and easily accessed? Well, again, no. There really is no plausible explanation for how those bones came to be present inside that chamber. Actually, there is one other possible explanation. Were the bones salted there by a modern version of the Piltdown prankster? This question must be asked. This scenario has by far the greatest odds of being the explanation. It is never considered in the world of evolution’s illusions. It certainly should be considered, after the many embarrassing hominids that were created out of faked evidence. A second question that must be asked is, who might have the greatest motive for doing such a thing? The list of possibilities is short, but, again, it’s never considered. Evo- illusionists don’t seem to be worried about being caught up in another fraud. True scientists should always be very careful not to let Piltdown Prank and Nebraska Tooth ever happen again. Evo-illusionists are not. The fossils of the hands and feet are very complete, which is also very strange since the skeletons are quite incomplete, and missing many bones. We learned from other hominid fossils like Lucy that the hands and feet don’t fossilize well because the bones that make them up are so small. Homo naledi broke that rule for sure. Homo naledi’s fingers are curved palm-ward, kind of in a half grasping position, like those of most apes, and not like human hands at all. The thumb is longer than the first joint of the index finger, which is a definite characteristic of humans. Unfortunately, there are no fitted, naturally articulated, bony connections from the hands and feet directly to the skull, so it can only be assumed that they belong to the skull because they were found in the same chamber. Homo naledi’s jaw comprised two broken pieces of the right half of the mandible. (lower jaw) One is the four-tooth fragment pictured on a previous page. A team member from the international team of scientists put the two portions of the right side of the jaw together and photographed them. He then composed a mirror image of the photo in his computer, which produced an image of a whole lower jaw. (fig. 7-14) Only one problem here of several is that the condyles are missing, which are the ball-shaped heads that fit into the fossa or socket of the skull; which are also missing. So models and computer simulations had to be made to come up with the entire jaw, and skull. There is no possible way to determine if the jaw fits the skull. That’s assumed by NOVA, NatGeo, and the team of international scientists because the jaw and skullcap were found in the fossil chamber. This certainly brings up memories of Piltdown Prank, whose condyles were removed from its lower jaw so it couldn’t be determined if it fit the skull. 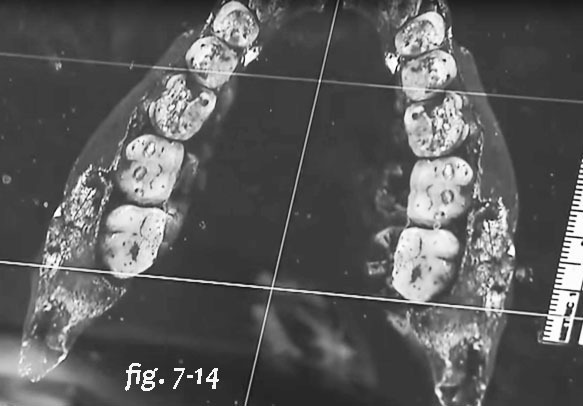 Also, the computer artist had full artistic license to can freely adjust Homo naledi’s dental arch. There is no way of really knowing how narrow or wide the curve of the dental arch actually was. 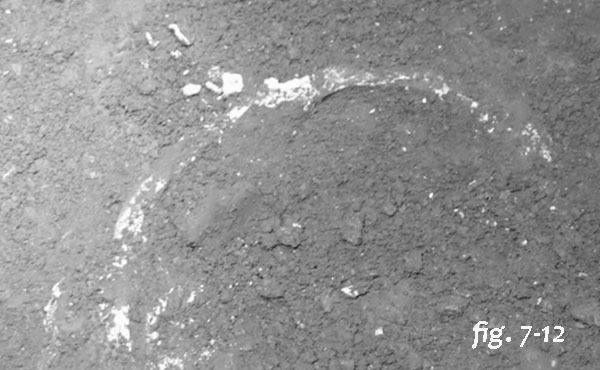 Figure 7-15 is a photo of Homo Naledi’s skull as portrayed on NOVA. This is all that was shown, so it must be surmised that that’s all there was. If an entire skull were found, it sure would have been shown and shown off; big time. So these skull fragments, and the two jaw fragments, and lots of plaster and imagination produced Homo naledi’s entire skull. Figure 7-16 is a picture of Berger making goo-goo eyes with his hominid. He’s obviously joyful about the find. More importantly, check out the frontal contour of Lee’s own upper and lower jaws, from chin to nose. Notice how it’s concave. Now check out the contour of Homo naledi’s. It protrudes like any ape’s jaws. The dental arch of Homo naledi is “U” shaped, even with the computer simulation, which makes it ape. It’s not “V” shaped like a human jaw. Does Lee realize he’s holding an ape skull? The Homo naledi find was huge news. It was published in National Geographic, The New York Times, Associated Press, and most major newspapers and periodicals throughout the world. As I mentioned, NOVA made a two-hour documentary on the discovery. In fact, the November 2015 issue of National Geographic displays Homo naledi on its cover, (fig. 7-17) along with a big article on human evolution inside. Is Homo naledi really “almost human”? 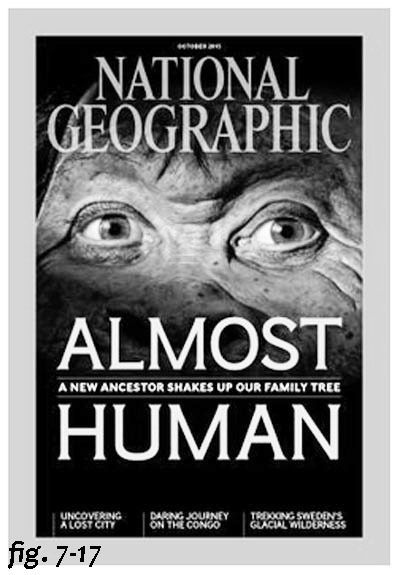 Or is NatGeo pushing the illusion. The acceptance of Homo naledi in the scientific world of evolution was total. Essentially there were no skeptics or questioners. Well, except me. I question. Think about this for a moment. Imagine if I spotted some bones like these in a cave. If I didn’t retrieve the bones, but I took a few photos of them, and showed them to an anthropologist, would said anthropologist’s first reaction be to round up a team of sixty international scientists? Would he put an ad on Facebook, asking for petite Ph.D. scientists who would volunteer to fly to South Africa, and to crawl through tiny snaky cave openings when he doesn’t really even know what kind of bones they are; or how many there might be? Would he transport the team of international scientists and the petite Ph.D. cave diggers to the cave? Would he set up tents and video monitors? Would he get National Geographic and NOVA involved? Would they be at all interested? 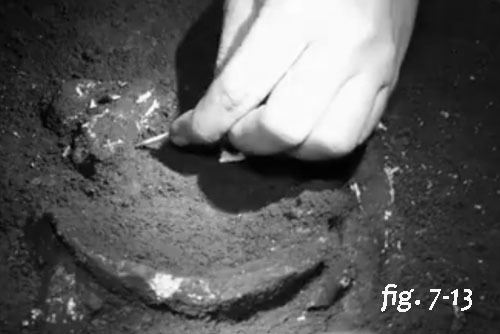 Would everyone that watched what was found and viewed on the monitor by the petite cave-digging women be uber-excited? The odds of these being animal bones placed there by some human, with an agenda, in recent history, or hom inid bones, are about 100,000:1 in favor of human placement. It seems very odd that all of that money and effort went into searching out these bones before anyone knew what they really were and how many there were; before Berger even had a single bone in hand, does it not? National Geographic again hired Evo-artist and sculptor John Gurche to make a model of Homo naledi. Gurche made some of the models I show earlier in this chapter. He spent 700 hours on Homo naledi’s model. He diligently placed and molded every facial muscle, placed the eyes, then the skin on a model of the skull. (fig. 7-18) He did everything any respectable evo-artist could possibly be asked to do, and he did it well. Gurche demonstrated how, in every case when he had the choice of using ape characteristics or human characteristics, he chose human. Notice the brain has already evolved enormously, in only hours, not millions of years. I put together a collage showing Gurche’s model, the skull, and a model that I assembled (fig. 7-19). I drew lines from the chin of Gurche’s model to the chin of the skull, and from the browridge on the model to the browridge on the skull. This allows for the matching of the skull and its size to the model and its size. Look at the enormous difference between the size of the cranium on the model and the size of the cranium on the skull. The model’s cranium volume is about one third that of the skull. The skull has no forehead; Gurche’s model has a large healthy one. Was Gurche told to add a cranium and forehead by whoever ordered the model? The arrow on the skull points to the location where the cranium descends and meets the middle of the browridge. On Gurche’s model, the arrow points to where the cranium so obviously descends well laterally or outside of the browridge, like a human cranium. Gurche’s brow ridges are far smaller than are those on the skull. The model has human-type eyes with large sclera, a thoughtful human expression, human hair that looks like it needs barbering monthly, human skin, and human ears. Gurche explained how he gave Homo naledi a human-looking nose because the nasal bone protruded like it does in humans. But the entire nasal area of the skull was missing and was filled in with white plaster by the modeler. Was Gurche unaware of this? Gurche’s model is completely inaccurate. It looks human when it should look ape, which is no doubt exactly what evolution’s illusionists ordered. A photo of the model accompanied every article on this amazing find in every newspaper and journal. It was what I first saw in my Orange County Register. Of course, I had to make my own model using the Homo naledi skull and good ol’ Photoshop. (right photo in fig. 7-19) I followed the shape of the skull exactly, as Gurche should have. I gave my model ape eyes with no visible sclera, ape ears, and a furry ape face. There is no barbering needed. The browridges follow those on the skull. And what do we have? An ordinary ape. Yes, Homo naledi isn’t a hominid at all. Fig. 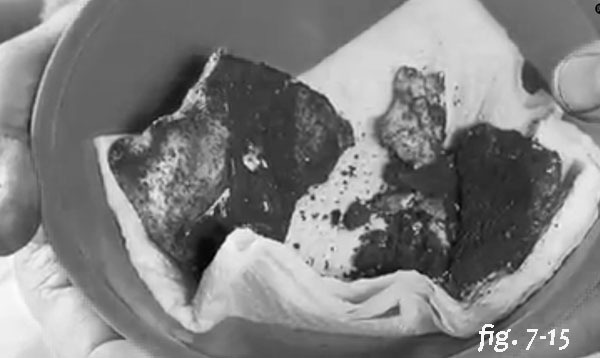 7-20 is a photo of all of the pieces that were retrieved from the skull. Yes, that’s all there is of the head of an animal that is credited with being a human ancestor. That’s all it takes. Find some broken up dirty primate bones… bingo, it’s a human precursor. Just think. Tens of thousands of dollars were spent on Gurche’s model. Whoever paid to have it done could have come to me for the job. I would have saved them a ton of money. Except mine wouldn’t have supported the illusion of human evolution. My model would be an honest one that follows the skull shape and outline. It would have ape features instead of 100 percent human features, as Gurche selected. So, I guess NatGeo would have fired me on the spot. Gurche knows what he’s doing, and how to keep his job. Can you imagine if Berger announced the finding of a new hominid, and it looked like my model? Like an ape, with all ape characteristics, like it should have, instead of all human characteristics as Gurche used? Berger would be a laughing stock. Because Gurche built his model to supp ort the illusion of human evolution by using all human characteristics on his model, Berger became famous in the world of paleoanthropology and NOVA viewers. Berger is a hero and the star of his own NOVA documentary! I wish NOVA and National Geographic came to me. Boy, could we make an incredible and interesting documentary! But that’ll be the day. What’s really interesting and actually kind of fun is how easy it is to perform the illusion of turning an ape into a hominid by only changing ape eyes to human eyes, as was done on the model of Homo ergaster in Figure 4-10. It really doesn’t take much effort, but the results are astonishing. 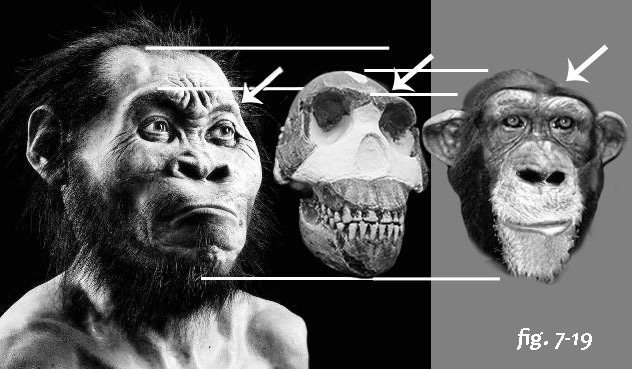 At left in Figure 4-11 is the face of an ape. Notice, the ape eyes don’t show sclera or the whites of the eyes. By simply giving the ape less ovoid human-type eyes, more white, and a smaller iris, (right) a proximate human face can be made to appear from an ape face. Notice that human eyes show almost 50% sclera. The change is very subtle, but the result is almost magical. Which one would you say is staring, which one is thinking? Which of the two would you say would be the most intelligent? Which might be most likely to make tools, or play pool or chess with you? Which is a recent human ancestor? Of course the ape-person on the right. You will see this technique used by evo-artists on virtually all hominid models and artwork I discuss in this book. Using expressive human eyes alone on hominid models can give the illusion that every fossil find is about ready to evolve into a human. I wonder what survival advantage, or what kind of mutations occurred that changed the large irises of ape eyes to the smaller irises of humans. What mutations greatly increased the display of sclera? I bet any evo-illusionist could answer that question, but I just can’t. It’s easy to see how using human-type eyeballs is used by Homo naledi to fool the masses. And fool them is has.